"Steve's Vise, Volume 8 Week 45 - Fly Angler's OnLine"
"Do you really tie your own flies on THAT? When I demonstrate fly tying on my extremely-low-budget and easy-to-build fly tying vises at public fly fishing gatherings that question is often directed towards me. The answer is yes. "Why would you do that?" is a frequent follow-up question. I have led Boy Scouts and 4-H youth in introductory fly tying lessons. These sessions in fly tying have begun with vise building. When students build their own vise they invest their sweat in the finished product. This sweat equity instills a sense of ownership in the finished product. There is also the benefit that the student can tie flies when the course is completed without the need to immediately invest in equipment. Young people are very quick to ask if this "thing" that they are building will really work or if it is just some "hair brained" idea. The best way that I know to convince them is to look them straight in the eye and say, "I tie on a vise like this all of the time, now sit down and I will lead you through the steps so that you can tie your first fly." Another reason that I tie all of my flies on homemade vises is that I can use my tying experience to improve the design of such a vise and to explore its strengths and limitations. One of the strengths of this vise is that the X-acto knife handle can be removed from the vise with the nearly finished fly still attached. You can then inspect the fly and make final adjustments to the fly such as trimming of flash and rubber hackles, or paint eyes on the fly while you view the fly from a variety of angles. I tie flies on hooks that range from size 20 to 1/0. However, this vise is at its best for hook sizes 18 to 4. This vise is named in honor of a friend who suggested that one of my earlier vise designs might be difficult for many to construct. His comment prodded me to develop this vise. In addition to tying flies on the vise shown here, I also construct fly tying vises with bases from unusual items. They include recycled barn door hinges, frying pans, a telephone, copper pipes with attached valves, and half of a bowling ball. They do attract onlookers at fly fishing and fly tying events. I haven't made one from a kitchen sink...well not yet anyway. The critical component in a vise is the mechanism that actually holds the hook. For this vise, an X-acto knife handle holds the hook for tying. It is held to the piece of plywood with a 5/16 wire rope clip (also known as a cable clamp). The wire rope clip is held in place by a wing nut and a flat washer on one side of the clip. (The other side of the wire rope clip is left without a nut). The plywood is attached to three pieces of 2 X 4 to provide a stable base. Nails and glue or screws and glue can be used to attach the wood pieces together. 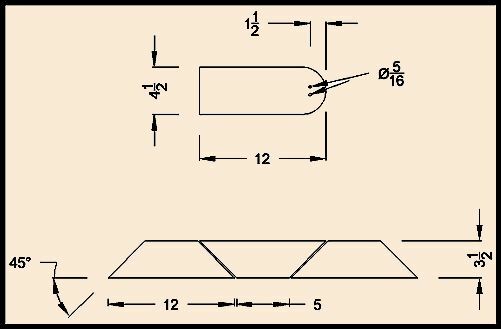 Follow these steps to place a hook in the vise. As with any tool, there is a learning curve before mastery is achieved. By following this sequence you can become comfortable with this vise after just a few tries. 2. Position the hook so that the angle formed by the hook shank and the centerline of the knife handle is approximately 45 degrees. 4. After the hook is sufficiently tightened, position the hook in the vertical plane by inserting the knife handle in the wire rope clip and tightening the wing-nut on the wire rope clip. A rectangle of 3/8 plywood is much stronger when the direction of the grain of the top and bottom plies runs parallel to the longer sides of the rectangle. 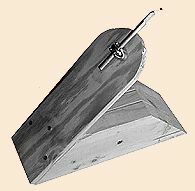 A piece of non-slip rug cushion or non-slip shelf liner attached to the bottom of the vise will keep the vise from sliding on a smooth surface. Center the wire rope clip holes 1 ½ inches from the rounded end of the plywood. 1	3/8" plywood 4 ½" X 12"
Figure 2. The layout of the pieces is shown above. The piece shown on top is drilled with two 5/16" diameter holes to receive the wire rope clip which holds the X-acto knife handle. 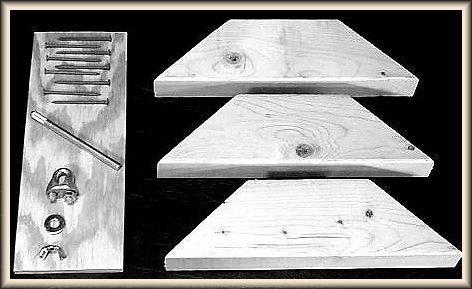 The lower drawing shows the layout of the pieces of a 2 X 4 for the base of the vise. Please check out the Fly Tying Section, on the Bulletin Board, here at FAOL too.